The Zebra Z-Band Direct is a 2.0 mil, white, coated, direct thermal, polypropylene face stock with pressure sensitive, permanent acrylic adhesive and a 1.5 mil polyester liner. This material is converted into direct thermal pressure sensitive barcode identification wristband. 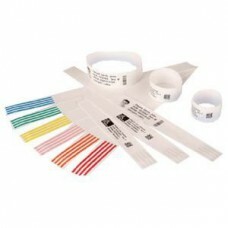 Offers tamper evident security slits, which allow for the wristband to not be replied once removed. The Z-Band Direct image is resistant to smear and abrasion as well as water, alcohol, mild cleaners, blood, etc. Zebra HC100, 2" Direct thermal..
ZEBRA HC100 WRISTBAND PRINTERDeveloped specificall..